Stanford is a thriving residential campus and community sitting on 8,000 acres of foothills and flatlands – once a horse farm belonging to Jane and Leland Stanford and still fondly known as “the Farm.” Living at Stanford brings surprises and new experiences every day, in an extraordinary community of creative and accomplished people from around the world. Stanford has a rich tradition of fostering creativity and the arts. A vibrant campus “arts district” is situated along Palm Drive near the Oval. Each of Stanford’s seven schools has its own mission statement. During Full Moon on the Quad, freshmen are kissed at midnight by seniors under the first full moon of the Autumn Quarter. Stanford students compete in 35 varsity sports and 20 club sports. Students, faculty and staff also enjoy state-of-the-art recreational facilities and fitness programs. Stanford has about 600 organized student groups for students to participate in. There are an estimated 13,000 bikes on the Stanford campus daily. Stanford has been named a Platinum-level “Bicycle Friendly University.” Freshmen may not bring cars to campus, but the free Marguerite bus service includes 79 buses in a 24-route system. Campus also hosts more than 65 Zipcars. There is no official mascot at Stanford University. The “Tree,” which is a member of the Stanford Band, is representative of El Palo Alto, the Redwood tree which is the logo of the city of Palo Alto. Since Stanford University and Palo Alto are almost inextricably intertwined in interests and location, it is a natural outgrowth of this relationship. The tree still exists and stands by the railroad bridge beside San Francisquito Creek – it is the site where early explorers first camped when settling the area. Stanford offers the kind of education needed for leadership in a rapidly changing world. Its seven schools – Humanities & Sciences, Engineering, Business, Law, Medicine, Education and Earth Sciences – offer a breadth of highly regarded degree programs that allow students the freedom to explore their intellectual and personal passions. The schools of Earth Sciences, Engineering and Humanities & Sciences offer both undergraduate and graduate programs. Graduate schools include Business, Education, Law and Medicine. Stanford has approximately 7,000 undergraduates, 9,100 graduate students, and over 2,100 faculty members. Stanford has many successful sport teams. Stanford students have won medals in every Olympic Games since 1908, winning 244 Olympic medals total, 129 of them gold. In the 2008 Beijing Olympic Games, Stanford won more Olympic medals than any other university in the United States. 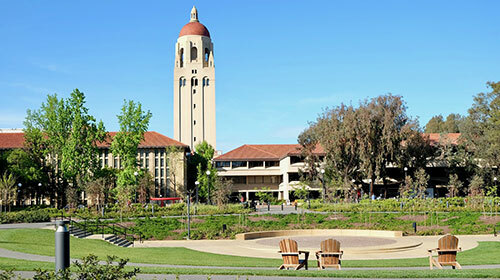 Stanford is one of the most research-oriented universities in the world. Since 1952, more than 54 Stanford faculty, staff, and alumni have won the Nobel and Stanford has the largest number of Turing award winners for a single institution. Stanford’s current community of scholars includes 19 Nobel Prize laureates and 4 Pulitzer Prize winners. In addition, Stanford is the alma mater of 30 living billionaires and 17 current astronauts. Amanda Brown wrote Legally Blonde based on her experiences at Stanford Law. (born December 30, 1975) won the U.S. Masters at Augusta in 1997 with a record score at age 21, making him the youngest man and the first African American to earn the title. Woods won another 13 majors and was named the PGA Player of the Year 10 times over the next 12 years, but he struggled to regain his top form after personal problems surfaced in 2009. (born October 17, 1956) became the first African-American woman to be admitted into the astronaut training program on June 4, 1987. On September 12, 1992, Jemison finally flew into space with six other astronauts aboard the Endeavour on mission STS47, becoming the first African-American woman in space. In recognition of her accomplishments, Jemison has received several awards and honorary doctorates.